Coach's Corner - Tinkers-Evers & Chance hand signed Cubs autographs. 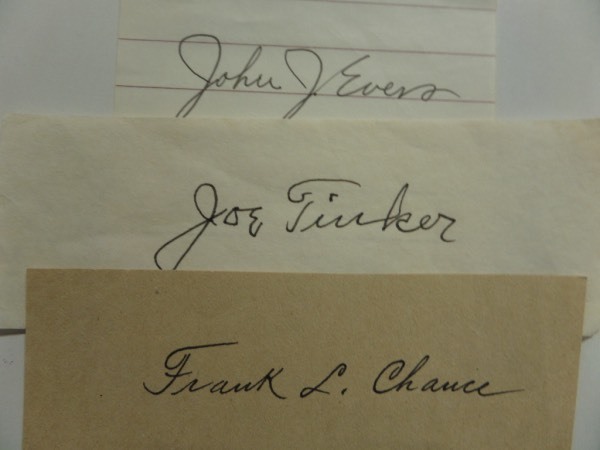 Go Back to Lot List Tinkers-Evers & Chance hand signed Cubs autographs. I believe that in my 26+ years here at auction, we have never sold a lot which featured all 3 HOF signatures in it. I see large signed cuts from all 3 immortalized Chicago infielders, and all 3 grade at least 8's or better! Nice trio, super high value, thousands in fact, and what a super lot to mat and frame together with a vintage group photo. Great Windy City opportunity, and sold with basically NO reserve as well.